3/24/16 NOTE: The newest firmware supplied by Grandstream has an additional feature on the trunks for "NAT." Please make sure that box is NOT CHECKED on your SIPTRUNK.com Trunk even if you are behind a NAT. A new guide for that firmware will be forthcoming. 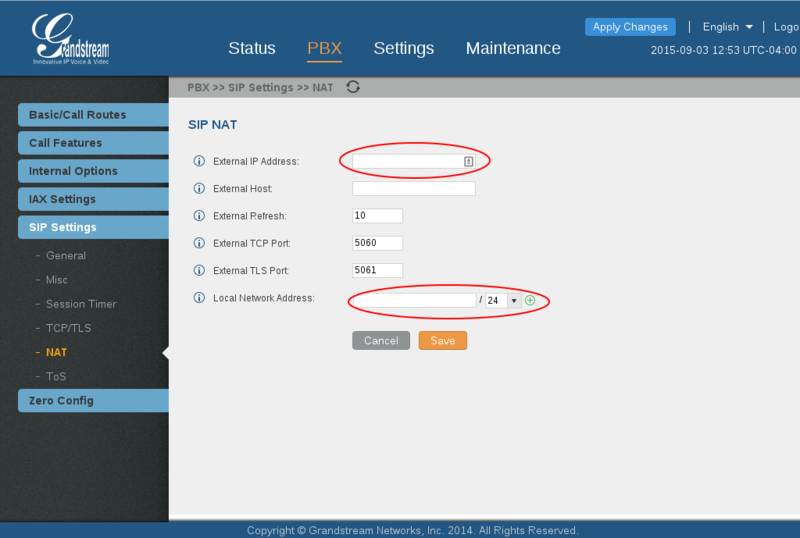 Grandstream UCM61xx IPPBX firmware version 1.0.5.14 has passed SIP Trunk interoperability testing with SIPTRUNK.COM on April 16th, 2014. This document introduces major configuration steps performed for interoperability testing between SIPTRUNK.COM and Grandstream UCM61xx_IPPBX. For detailed information to configure SIP Extensions, PSTN lines, SIP trunks and all the other system settings via web GUI, please download the UCM61xx user manual from Grandstream web site:http://www.grandstream.com/products/ucm_series/ucm61xx/documents/ucm61xx_usermanual_english.pdf . Connect the other end of the Ethernet cable into the uplink port of an Ethernet switch/hub. Connect the 12V DC power adapter into the 12V DC power jack on the back of the UCM61xx. Insert the main plug of the power adapter into a surge-protected power outlet. Wait for UCM61xx to boot up. The LCD in the front will show its hardware information when the system boots up. Once the UCM61xx is successfully connected to network, the LCD will display its IP address. The web GUI login page will be displayed. Default username and password for administrator are admin/admin. - In the "Use Failover Trunk on your first rule:" section select the "SIPTRUNKCOM-GW2 Trunk" and set the "Strip:" field to "0"
Use Trunk: "SIP Trunks -- SIPTRUNKCOM-GW1"
Use Failover Trunk: "SIP Trunks -- SIPTRUNKCOM-GW2"
Click on PBX → Basic/Call Routes → Inbound Routes, click on Create New Inbound Rule →, select the SIPTRUNK.COM VoIP trunk just created, enter the DID Pattern, Default Destination for an inbound route using the SIPTRUNKCOMPrimary SIP trunk. With extension 1001 as the default destination, calls coming in from the SIPTRUNK.COM Trunk will ring extension 1001 directly. Thanks for this work perfectly. How about GAC 2500 configuration do have the instruction as well? Hoping you can provide it also.